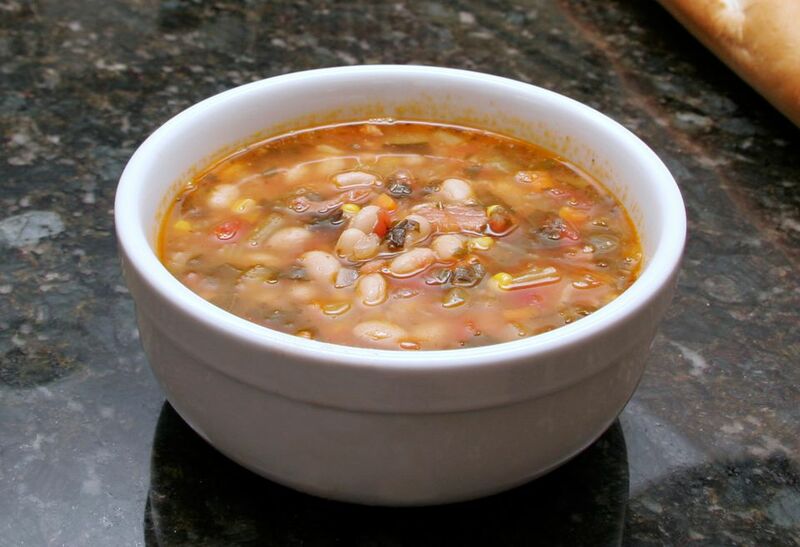 This hearty ham and bean soup is the kind of soup you crave on a cold fall or winter day. It's a simple preparation using dried beans and diced ham along with chopped vegetables. The flavor comes from the long simmering. Add a ham bone or ham hock for the extra smoky flavor. It is an excellent way to use leftover ham! We like hot baked cornbread with the soup, but biscuits slathered with butter or thick slices of crusty homemade bread would be equally delicious. It's a great lunch soup, too. Serve it in cups with sandwiches or a simple tossed salad. Bring the water and beans to a boil in a large saucepan or Dutch oven; boil for 2 minutes. Remove the beans from heat, cover, and let stand for 1 hour. Add the ham and ham bone or ham hock to the beans, along with onion, carrot, celery, bay leaf, and pepper. Bring to a boil. Reduce heat, cover, and simmer until beans are tender - about 1 1/2 to 2 hours. If soup is too thick, add a little more water. Skim any foam from top. If you used a ham bone or ham hocks, take them out of the soup and remove the meat. Dice or shred the meat and return it to the soup. Add the tomato sauce and salt, to taste, and simmer for about 15 minutes longer. If you soak the beans overnight, use 8 cups of water and skip the first step of boiling the beans and letting them stand for an hour. This soup is good for tailgating. Transfer the finished soup to a slow cooker and take it along to a party or event. Keep it on low or on the warm setting for serving. For some extra texture and flavor, add 1 can of diced tomatoes to the soup along with the tomato sauce. For extra color, add a cup of corn kernels to the soup shortly before it is ready. Add 1/2 cup of multicolored chopped bell peppers along with the onions.